My, my, how can we resist you? We can’t, actually. Mamma Mia: Here We Go Againis a joyful, blissed-out summer treat so sunny that audiences should apply themselves with SPF 30 before entering the theater. Just like the hit 2008 original, the charming comedy musical is full of toe-tapping ABBA hits and dancing queens — and would-be kings — on a Greek island. Plus . . . it has Cher. In a platinum blond wig. And platform heels. And a spangled silver jacket. Singing “Fernando.” Thank you! (For the music). Craziest thing of all in a crazy-fun movie? 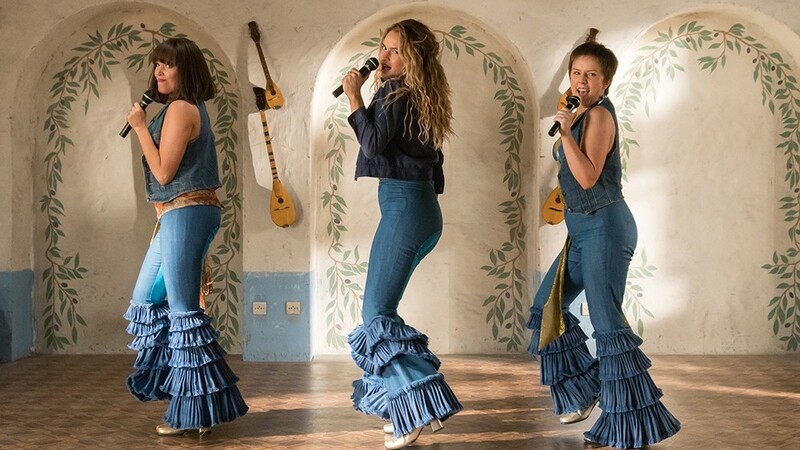 Mamma Mia: Here We Go Again, with its sharper story, cleaner dancing and stronger vocals, benefits from the absence of Meryl Streep. The blatant bizareness of watching the greatest actress in the world dance on a bed in overalls and warble love songs to an off-key Pierce Brosnan is all the past. That’s because, as you likely surmised from watching the trailer on a loop, the writers have killed off her Donna character. Now Donna’s daughter, Sophie (Amanda Seyfried) is working hard to open a hotel in her honor on that same picturesque Greek island where Donna did it in the late 1970s. There are hurdles: She has a difficult time managing a long-distance relationship with her husband (Dominic Cooper). A bad storm threatens to ruin the grand opening. She seeks solace in Donna’s daffy best friends (Christine Baranski, Julie Walters), who tell her all about Mamma’s own journey. Way back in 1979, fresh college grad Donna (Lily James) declared, “life is short, the world is big, I wanna make some memories.” She sets off for Europe, where she gets it on with Bill, Sam, and Harry. (Um, yeah, just forget about Donna’s diary entries at the start of the original film. Details, shematails.) In the present day, the men are still played by Stellan Skarsgard, Colin Firth and Brosnan. All of them aged, er, naturally, prompting one local to take a jab at Skarsgard’s appearance. It gets a big laugh. Their younger selves — Josh Dylan, Jeremy Irvine and Hugh Skinner — are suitably more dashing. And decent singers! The radiant James, a former big-screen Cinderella, is the biggest winner of all. She’s pure sunshine. Once again, ABBA songs take center stage amid all these antics. Because the Greatest Hits were all used up in Mamma Mia, prep for some unfamiliar B sides such as “When I Kissed the Teacher” “Angel Eyes” and whatever ballad Seyfried was crooning when she got sad about Cooper. But don’t worry, Chiquitita: You’ll still get solid gold such as “Super Trouper,” “Waterloo” and the title track. The “Dancing Queen” extravaganza is a show-stopper. Sitting in the dark without moving a muscle during that kind of performance is just plain wrong. Yet for all the effervescence, the film hits an emotional note as well because of Donna’s death. Another scene might even bring you to tears. It helps that Seyfried, a gorgeous talent who has lovely vocals, is a sensitive and mature presence. No longer the wide-eyed ingénue, she’s blossomed into a movie star that can carry a star-loaded musical. Seyfried has said that she prefers Mamma Mia: Here I Go Againto the original. Though that’s the typical party line when promoting a movie, I believe her. There’s a moment when James, the sun streaking through her golden hair, sits out on the water and asks one of her suitors to stay on the Greek island with her. Quite frankly, her joie de vivre speech made me question all my life decisions, including the one in which I live in a sweaty metropolis. The Greek life humidity doesn’t even affect anyone’s hair! We should all find a way to bask in an international ABBA paradise. Until then, let’s sit back and have the time of our lives.